Seward head coach Bryan Zollinger and assist Patrick Nee both told KSCB radio this would be the toughest game so far. And it was. Seward slipped by Wichita Sunrise Christian 74-72 in overtime Saturday night in the Pizza Hut Classic in the Green House. Seward trailed 32-29 at the half. 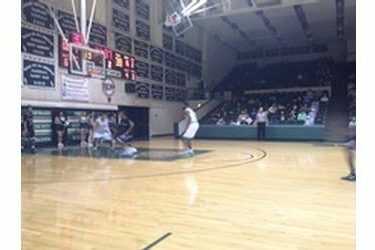 Seward led 63-59 with 23 seconds remaining before the Buffaloes stormed back to tie the game. Seward held an advantage at the foul line going 27-33 while Sunrise was 16-21. Niem Stevenson led the Saints with 27 and was 15-20 at the line. Marcus Mathieu had 18 and Charles Beauregard scored 11. Seward shot just 32 percent from the field. The Saints are 4-0 and play at Dodge City Friday and Saturday facing Labette at 3:30 Friday and Lamar JV Saturday at 2.